Technology has the potential to transform the classroom, build access to new mathematical content, and provide access to students through unique representations. For this study, the authors considered the transformational promise of digital fabrication technology, specifically 3D printing, in a setting comprised of pre-service teachers. An introduction to digital fabrication session was implemented in a secondary mathematics methods course. Participants were assessed both prior to the experience and after, using an adapted TPACK developmental self-report survey to consider TPACK themes and subthemes. In this chapter, the authors describe ideas that emerged from narratives provided by participants, patterns of change noted from pre- to post-assessment, and three cases that emerged representing students who experienced the most positive changes, most negative changes, and least amount of change on self-perceived levels. It has long been acknowledged that neither pedagogical knowledge nor content knowledge alone is sufficient for effective teaching (Shulman, 1986). The overlaps of knowledge domains have been widely studied over the past two decades and have come to integrate technology as more tools are available and necessary for teaching and learning mathematics. 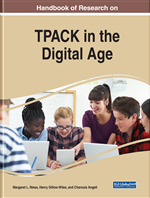 Technological pedagogical content knowledge, or TPACK is the knowledge that encompasses the overlaps of technological knowledge, pedagogical knowledge, and content knowledge. This model recognizes the complexity of a variety of knowledge domains: technological knowledge, pedagogical knowledge, content knowledge, technological pedagogical knowledge, technological content knowledge, pedagogical content knowledge, and technological pedagogical content knowledge (Niess, Ronau, Shafer, Driskell, Harper, Johnston, Browning, Özgün-Koca, & Kersaint, 2009). TPACK Themes: Overarching facets of mathematics education, which include curriculum and assessment, learning, teaching, and access. Technology Integration: Consistent use of instructional technology for the purposes of engaging students in learning. Technological Pedagogical Content Knowledge (TPACK): The knowledge that encompasses the intersections of technological knowledge, pedagogical knowledge, and content knowledge. Instructional Technology: Technology used for the purpose of fostering student learning of mathematics. Survey Item: A set of five descriptors found in the TPACK developmental model self-report survey which align to a specific theme or sub-theme of the TPACK developmental model. Emerging Ideas: Patterns of thought evident through participants’ written narrative on the TPACK developmental model self-report survey. Descriptors: Phrases used in the TPACK developmental self-report survey to describe a teacher at a defined level for a theme or sub-theme. Sub-Themes: Specific components of the TPACK themes, described in the TPACK developmental model. Digital Fabrication: Process for making physical objects through the use of a computer.